There is nothing better than a fish taco, it’s refreshing, it’s tasty and it’s so different from the usual summer meals! Here is my recipe of Halibut fish taco with a quick homemade salsa. On a baking tray covered with aluminum foil, add the halibut. Brush the halibut with olive oil and season with the remaining ingredients “FOR THE HALIBUT”. Close the aluminum foil, to create a nook for the fish. Cook in the center of the oven for 20 to 25 minutes, or until the fish is fully cooked. In the meantime, in a bowl, add all the ingredients « FOR THE SALSA » and keep aside. In a small bowl, add all the ingredients “FOR THE SPICY MAYONNAISE”, mix until well combined. To create the mini tortilla bread using our homemade tortilla bread recipe. Follow every step of the recipe and divide the dough ball into 12 portions instead of 8. 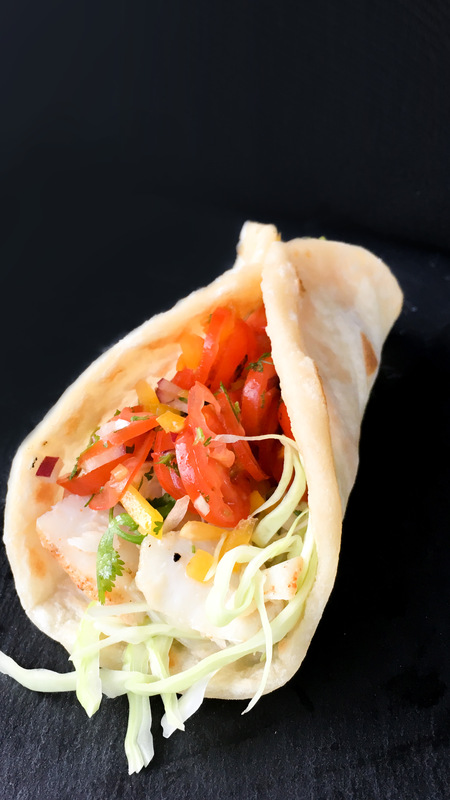 Serve the fish on a mini tortilla bread brushed with spicy mayonnaise, add the salsa and the coleslaw to garnish.